Turkey & Red Lentil Soup – Savory and Hearty Goodness!!! I had some red lentils left over from the soup I made a few days ago. I thought I might as well throw those in a pot and get creative. I didn’t feel like going vegetarian this time, so I added some ground turkey, but you could leave that out of the recipe. This turned out to be a very savory, hearty and delicious dinner for my family. They really enjoyed it! This recipe could easily be adapted to make it vegan friendly. As I frequently do, I thought I would sneak some vegetables into the soup. 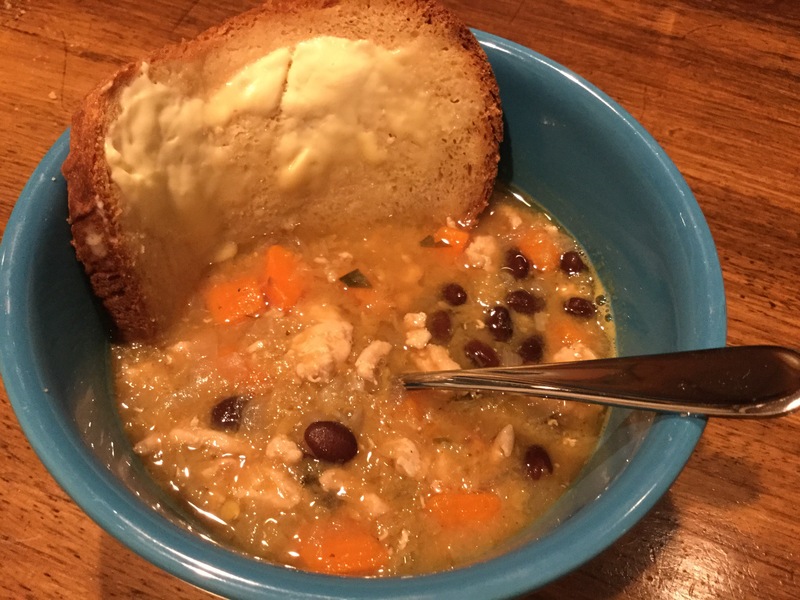 This kept it to a one pot meal, so all I had to do was serve the soup and folks could grab a slice of the bread I made to go with it. I happened to have sweet potatoes on hand, so I diced a couple of these up and added them to the soup. After cooking with the lentils for quite a while, these sweet potatoes melted like butter in your mouth when eating the soup. Yumm!!! Now I got creative with the spices in this version. You might not have some of the spices I used in your pantry, but that’s OK. As I always say, play with your food! Give your spices a smell and taste a little and see if you think it would add an interesting dimension to your dish. You might discover a new flavor profile that you love! I chose to cook mine in my Dutch oven on the stove top, but you could also put this in a slow cooker, but if you’re doing this you’ll want to cook it on low for 6-8 hours. Using the Dutch oven, my cook time was about 2 hours total. Put lentils and broth in pot and bring to a simmer over medium low heat. Add next 9 ingredients (sweet potatoes, beans and spices) to lentil pot. In a frying pan, cook ground turkey and onions. Cook until turkey is browned and onions are soft and translucent. Add turkey and onions to soup pot. Continue to simmer. For the last 30 minutes, tilt the lid to allow some of the liquid to cook off. You may need to increase the heat a bit to maintain a simmer. You want to allow your lentils about 2 hours total cook time. Salt and pepper your soup to taste. Our family just adores meat loaf. I have a basic recipe that I usually use and it is just delicious! The texture is good. It’s firm without being dry. Using ground turkey keeps it lean, so if you’re watching your weight this is a good recipe for you. 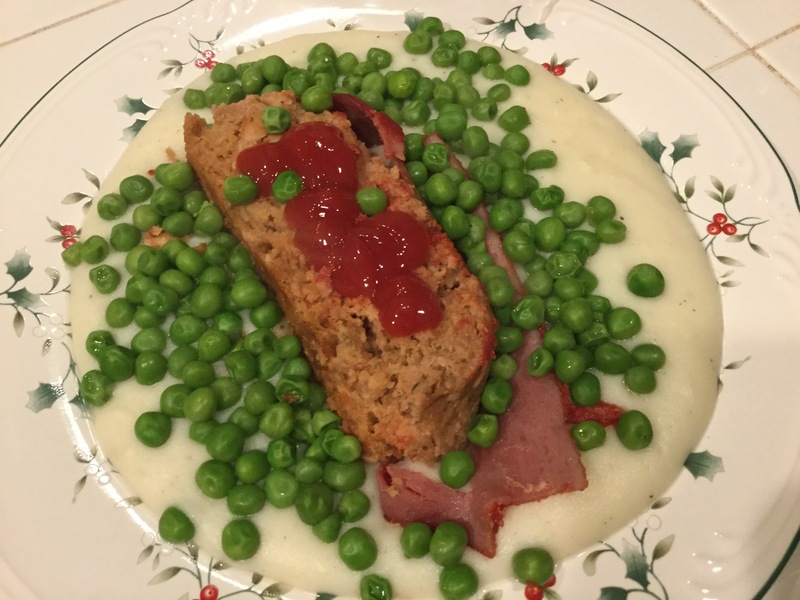 We usually serve our meat loaf with mashed potatoes and peas. My younger daughter and I weren’t big pea fans, but when you can mix them with your mashed potatoes they are yummy! The great thing about this recipe is it is super easy and you can play with in a bit. Last night, I was out of ketchup, so I substituted barbecue sauce. I also laid some slices of turkey bacon over the meat loaf and then topped with the tomato sauce. These were some delicious flavor additions! Preheat oven to 350 degrees. Mix first six ingredients in a bowl. Drop into a greased baking pan and shape into a loaf. Pour can of tomato sauce over loaf. Bake meat loaf for 45-50 minutes. 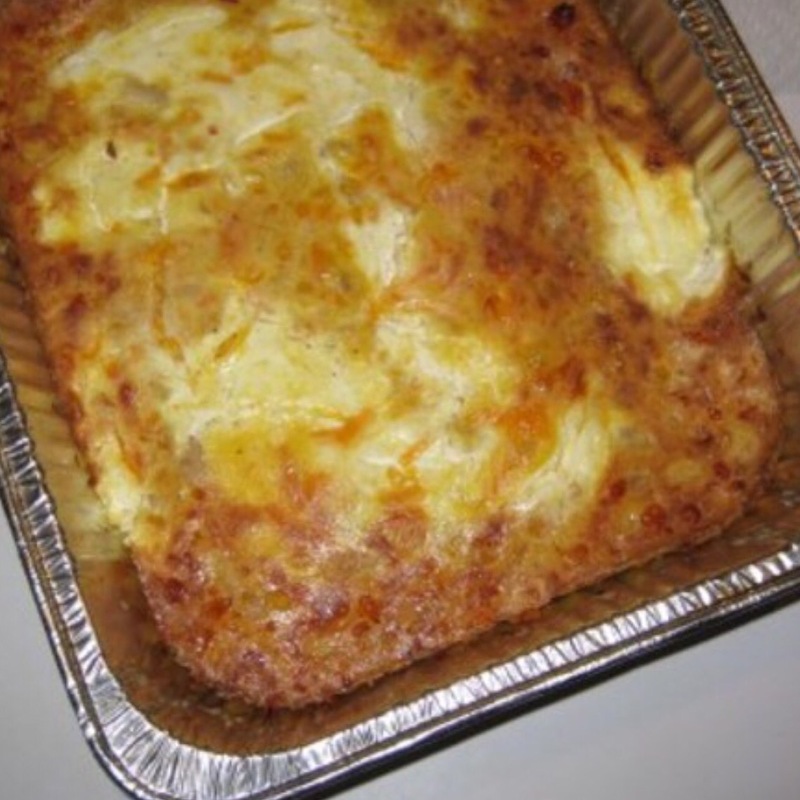 Turkey and Cornbread Casserole – Use Your Leftover Turkey! So after a day or two I get bored eating the Thanksgiving leftovers as is. I’m ready to start cooking again and get creative in the kitchen, so what can I make with all that leftover turkey? How about a yummy casserole!?! This recipe uses pretty basic ingredients that most folks will have in their kitchen. I hope you enjoy it as much as my famly and I do! Cook onion in hot oil in a skillet over medium-high heat until tender. Set aside. Combine cornbread and poultry seasoning in a large bowl. Layer half of cornbread mixture on bottom of a 11×7 baking dish sprayed with cooking spray. Combine onion mixture, chicken, and next 6 ingredients in a bowl. Spoon mixture evenly over top of cornbread mixture in baking dish. Top evenly with the rest of the cornbread mixture. Bake covered at 350 degrees for 30 minutes or until bubbly. Remove frrom oven and top with shredded cheese. Bake uncovered 10 minutes more or until cheese is melted and starting to turn golden. Makes approximately 6 servings. Poultrry Seasoning Tip: I once found myself without poultry seasoning and looked up how to make it with other spices. Happy Thanksgiving!!! Need Last Minute Recipes??? If you’re looking for last minute recipes for your Thanksgiving dinner, check out my previous Thanksgiving series of blog posts. You’ll find everything from hummus appetizer, cranberry sauce, salads, barbecued turkey to a wonderful chocolate pie. You’ll find lots of great recipes that are sure to be a hit! I hope you have a blessed time with all your loved ones!!! Happy Thanksgiving!!! Cornbread Chorizo Dressing – This stuff is the BOMB!!! Sweet Potatoes and Apples – Always a crowd pleaser!!! The Joy of Mashed Potatoes! Green Bean Casserole – Made from scratch with all fresh ingredients! Delish! Cranberry Salad – This may not be the healthiest salad, but with cranberries, green apples and mini-marshmallows it is so pretty! Hummus – A light, healthy dip to keep your appetizers light and leave plenty of room for the main meal! Platte County Pie – Like pie? Like chocolate chip cookies? You’ll love this pie! I even covered some ideas for your leftovers! 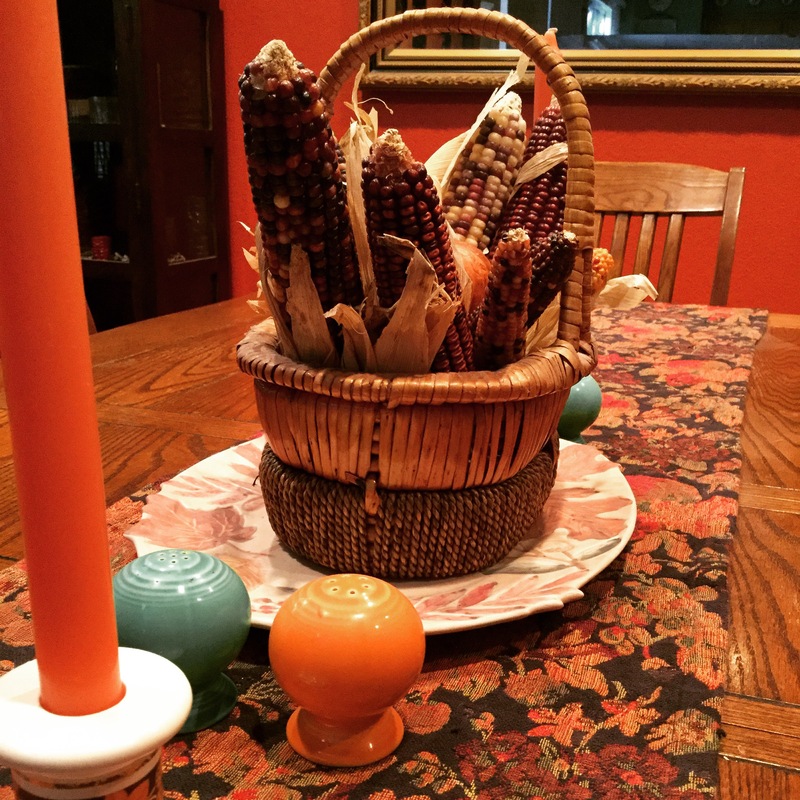 It’s not to late to review these posts and get your Thanksgiving dinner planning underway! I wish all of you a wonderful and blessed Thanksgiving! Please feel free to send me comments with your questions. I’ll try and make time in all my cooking to get back to you ASAP. I am so thankful to all of you that take the time to read my blog! 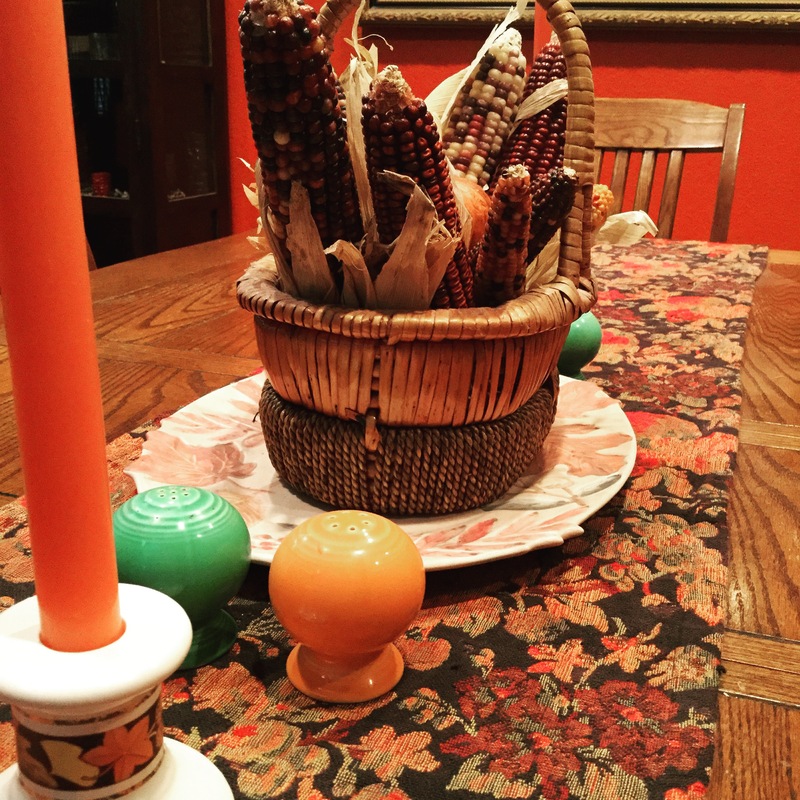 Please let me know how your Thanksgiving dishes turn out! This is more of a post-Thanksgiving tip, but it’s something that I usually take care of on Thanksgiving Day following our dinner. So you’ve devoured your dinner and stashed your leftovers for all those creative dishes you’re going to make in the coming days! What are you going to do with the turkey carcass? Toss it? Don’t!!! If you do any amount of cooking, you likely use chicken broth. I know I use it quite frequently. That turkey carcass is going to save you some money! Put that carcass in a large stockpot and cover with water. Cover your pot and put over medium-low heat bringing to a simmer. Once simmering, reduce heat to low and allow to simmer for 2-3 hours. That’s it!!! Easy, right??? Of course, you can jazz it up if you like with salt and pepper, carrots, celery, garlic, etc. I prefer to keep mine very basic, because I freeze it and use it for a variety of dishes. If you know you’re going to make soup with it, go ahead and add the veggies you choose, so their flavors can blend with your stock. I put my homemade stock into every plastic storage container I can find! Be sure that you do not fill your containers to the top, as liquid expands as it freezes, so you need to leave some room. This frozen stock can be pulled out and thawed slowly when needed or you can pop it in the microwave and thaw quickly. I use mine the same way I would use chicken broth in any recipe. Sometimes it does impart a different flavor, especially if you highly seasoned your turkey by smoking or brining. I haven’t had too much of a problem with this though. The great thing about making your own stock, besides being so easy and a money saver, is now you know EXACTLY what is in it! You control the sodium content and there are no preservatives or other chemicals. I also do this any time I cook a whole chicken and have a carcass afterward. There is a lot of flavor in those bones!!! 1. You need a barbecue deep enough to accommodate whatever size turkey you’re cooking. We started with a simple Weber kettle and now we use a CharGriller barrel grill. Those square Meco grills tend to not be deep enough unless you’re cooking a really small turkey. 2. The secret to a moist bird? Stuff it with moist ingredients that will evaporate into the bird as it cooks. We stuff our bird with a variety of fruit, garlic and onions. Remember the flavors of what you stuff it will impart flavor to the bird. I usually use a variety of citrus fruits, apples, and or pears. The stuffing just gets thrown out after the bird has cooked, but all that fruit juice that evaporates into the bird makes for a moist and flavorful turkey. 3. Want that smoke flavor? Add some wood chips to your briquettes. We like to use wood from fruit trees. Our favorite is apple. Some of the other woods, like mesquite, can be overwhelming. The fruit wood provides a mellow, sweet flavor to the bird. Be sure to soak your wood chips overnight, so they don’t just catch fire and burn up right away. You want them to burn slowly and give off lots of smoke. My husband has also been known to pour some brandy or tequila in with the chips as they soak for additional flavor. 4. As I always like to say, play with your food! Over the years, we have tried a variety of things and they’ve all been good. We’ve brined our bird and we have injected our bird. These strategies both add moisture and flavor. Don’t be afraid to try different things! If brining, I will tell you to be cautious with the zip-lock brining bags and how you store your brining turkey. Let’s just say I had one pop open on me and then was dealing with about 2 gallons of liquid on my kitchen floor. It wasn’t a good day, but we recovered. Maybe I’ll include a brine recipe in a future post. 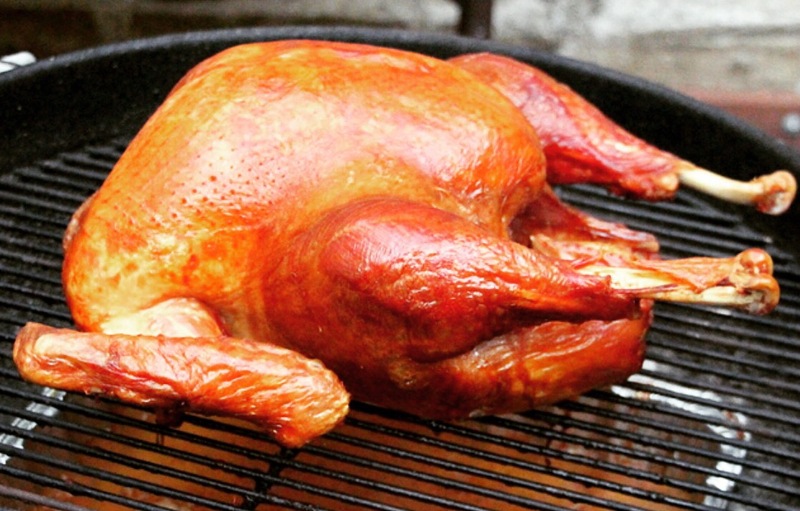 So let’s get to the actual recipe for barbecuing your turkey! To prep turkey, clean out the chest cavity removing neck bone and any organs. I discard these things, but some people cook with them. Ensure the turkey is completely thawed, inside and out. Season the outside of the bird and inside the cavity with salt and pepper or a barbecue rub. Stuff the bird generously with the fruit and savory ingredients. Prior to seasoning, some people like to rub their bird with oil or butter. In an effort to keep fat and calories down, I opt not to do this and my turkey still turns out moist and delicious. This is also the time you would inject your turkey, if you decide to do so. Place turkey in a turkey baking rack, so it can be moved more easily. You’ll want to use the indirect method to cook your turkey by creating two beds of charcoal on either side of your grill. Add soaked wood chips to charcoal if you choose. In between the charcoal beds place an aluminum drip pan to catch your turkey’s drippings. Replace your grill’s grate. Place turkey in rack on grill grate and close barbecue. Every hour add 5-8 briquettes to each charcoal bed. Add carefully, so you don’t get ash on your turkey. Also, add additional soaked wood chips, if you’re smoking your bird. Your remaining charcoal should be hot enough to light these newly added briquettes. You can also baste your turkey with the drippings at this time. If the dripping are too hard to get to, which is the case with some grills, just baste with chicken broth that you keep warm on the stove. Cooking time should be about 11-13 minutes per pound. For example a 20 pound bird should take about 3 1/2 hours. A meat thermometer should register 180 degrees in the thigh or 170 degrees in the breast. Let the bird rest 10-15 minutes before carving. Remember that smoking the bird will sometimes make the meat a pink color, this doesn’t mean it’s not cooked through. Discard the fruit stuffing. It’s job is done! 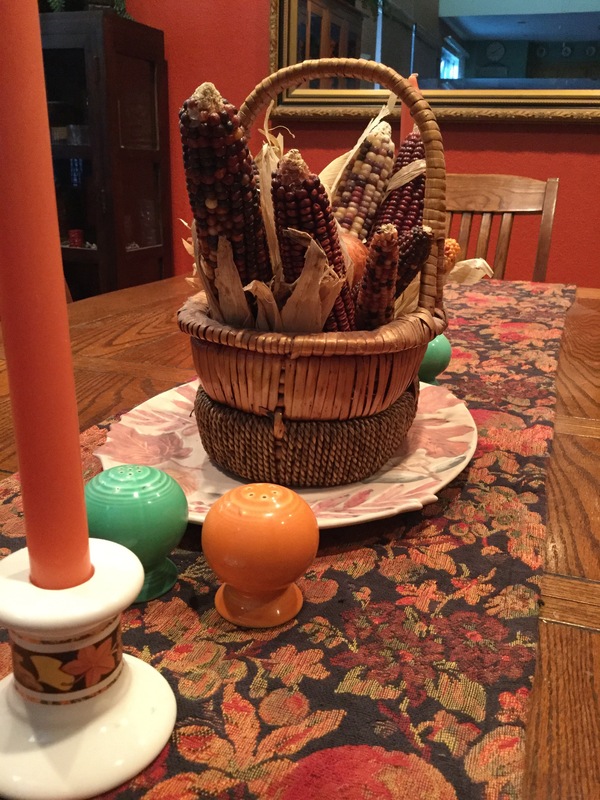 Coming Soon to a Blog Near You – Thanksgiving Tips! Just a teaser here! I’ve been anxiously awaiting this month! Thanksgiving is my jam and I can’t wait to share my cooking tips, tricks, and techniques with all of my food blog friends! So if you haven’t followed my blog yet and you want to learn some skills that will make your Thanksgiving delicious and stress free, follow my blog now! I’m going to have a series of Thanksgiving related blog posts! MMMMMMM! Turkey! Stuffing! Mashed potatoes! Sweet Potatoes! Salads! Veggies! Desserts! The list goes on and on! Come join the glutenous fun!!! !